plum crumble, originally uploaded by shaunaforce. Last night, I made the most exquisite crumble I have ever eaten. Im not kidding. The first taste I took made me moan and nearly fall to my knees in the kitchen. Im not going to say much about this one. Ill let the pictures do the talking, and the recipe should lead you to making it immediately. Since her description of the plum crumble is so wonderfully evocative of the actual taste, Im not going to add to it. I cant. I just want to run back to the kitchen and taste it again. Today, I took a significant chunk of the crumble to school with me, to share it with people there. And to keep it away from me. Im not kiddingI had to work hard last night to not just stand at the stove and spoon the entire crumble into my mouth. Its that damn good. So I took it to school and spooned it into the mouths of my colleagues instead. One of them, my dear friend who is a vegan, approved of it, even though its full of butter. Everyone made that little moan. Most of them asked for another bite. But it was gone fairly quickly. And one of my students, the boy who loves to cook, took one bite and said, I cant tell the difference between this gluten-free flour and regular flour. Bingo. Suddenly, Im thrilled that its autumn. I couldnt have made this crumble in July. But Im going to make it again this weekend. °Heat oven to 375° degrees, with rack in center. ° Thoroughly mix brown sugar, 1 1/2 tablespoons flour, 1/4 teaspoon cinnamon, ground ginger, and candied ginger. Add to plums an dmix well. Arrange, skin side up, in ungreased, deep 9-inch pie plate. °Combine remaining sugar, baking powder, flour, cinnamon, and salt. Mix well. Stir in egg. Then, using hands, mix thoroughly to produce little particles. Sprinkle over plums. °Drizzle butter evenly over crumb mixture and bake for 30 to 35 minutes. 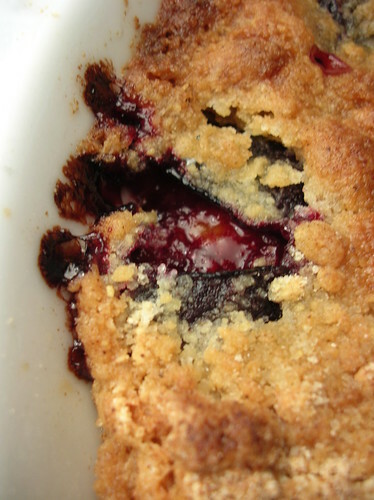 The crumble is done when the top is browned and plums yield easily when pricked. Remove from oven and cool. °Serve warm or refrigerate for up to two days or freeze well covered. As you know, I agree–this is definitely the best crumble I’ve ever eaten! I had to put my leftovers in the freezer to keep my spoon from finding its way into them. Lovely close-ups of that delicious purply ooze, m’dear. This is a recipe that I have to try! I often wonder what I should do with plums or prunes. I like them a lot but it’s difficult to find a recipe that preserves their flavour and this seems to be it!! I live in Italy and here they have loads of varieties so I wonder what could be the Italian plum…dark yes but is it round or oval?? Smallish? Makes me want to swoon just reading about it. I’ve tagged you for the 23rd post, 5th sentence MEME. Since I love you read your posts, I’m eager to know what your were thinking when you started blogging. 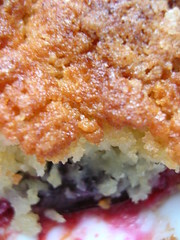 How funny – I just posted today about making that infamous plum torte… am wishing now I had chosen the crumble instead! Okay, you’ve convinced yet another. I have to make that crumble! What type of flour did you use? A mix? Inquiring minds want to know! Shauna, I must stop reading your blog before I’ve eaten. I have apples on the counter, wonder how this would work with them. I just wanted to say, thank you, thank you, thank you. Your enthusiasm is contagious. My two year old daughter can’t eat gluten, oat, corn or egg. I have found a lot of information via your links and my attitude has improved via your blog. This week the entire family has been able to sit down together and enjoy dinner. With my imagination sparked I have been able to find meals that are friendly to the little one while still being enjoyable to the rest of us. It is all in the attitude. I’m convinced! I’m convinced! I’ll be running along to the farmers market to scout out some plums in exactly 48 minutes (that’s how much time I have left at work before I can leave and not feel guilty for leaving early). Thanks for the recipe! Sounds wonderful, and it’s corn-free, so it’s safe for me! Whoo hoo! This sounds delicious. I just have two questions. 1)Do you know what’s in the gluten-free flour; is it one flour or a mixture? It’s not available here so I would have to mix it up. 2) What kind and model of camera are you using? I really admire your close-up photos! Nice crumble. Nice pictures. Nice of you to post recipes. I’m looking forward to trying this crumble too and I’m also interested in what GF flour mix you use. I usually use Wendy Wark’s flour mix (from Karen Robertson’s cookbook Cooking Gluten Free). Thanks for the compliment on the photo. That means a lot to me, coming from you. And actually, you making that crumble first is what made me finally try it! Oh, it’s definitely swoony material. And thanks for the meme tag. I actually have that one planned now! Definitely try the crumble. It sounds better than the torte (and the writer said so too). Sorry yours didn’t work out, but at least you got a good piece about it! Yes, you do! And start right now! While the Italian plums clearly impart some kind of special magic into this crumble, I’m certain that any fruit would still taste scrumptious with this! Hello there, my dear. I’m sorry to make you hungry before breakfast. No I’m not. That’s what I’m attempting. Apples would be fabulous, I’m sure. But it’s worth it to seek out the plums. You have made my day! Thank you so much for saying that. It humbles me deeply that an American family in Japan would be eating something I suggest or be inspired by my words. I’m thrilled to be helping you and your family. Please let me know if there’s anything you’d like me to try for you, or suggest. And you have a wonderful website. The photographs are so lovely. Did you make it yet? How did it turn out? Please come back and tell me! Thanks for the compliment on the photos. I’m using a Nikon Coolpix 4100. It’s a basic little camera, nothing fancy, but it has a great macro setting. And by now i”m completely unafraid to bend down over food wherever I go, sticking my nose into it! I’ve been loving taking photos, so thanks for asking. Well, girl, start making this crumble! You’ll love it. Thank you. And thanks for stopping by. Good website you have going there too. I forgot to specify! For months now, I’ve been using the Gluten-free Pantry French Bread and Pizza Mix for my gluten-free flour. It’s good. I just use it as a direct recplacement for flour now, put it in my flour canister in the refrigerator and forget about it. There are others out there, and I’m testing a new one–watch for the post, but I really just like this one. I also really like Karen Robertson’s book, and I’ve been wanting to try her Wendy Wark mix. But I took a gluten-free cooking class with a woman here in Seattle who suggested that this mix, which is available in five-pound bags from their website, is better, and easier. Islandchi, since you can’t buy it there, the label reads: rice flour, potato starch, cornstarch, crystallized honey, guar gum, and salt. It’s really silky and light, like a good baking flour. I never use it as the mix anymore. Experiment and let me know what you think! Fabulous crumble! I did it with cherries, as we’d just picked some and needed to use them. Made it for friends who are coeliacs, but (unlike so many other coeliac baked goods) I will be making it again just because it’s so fantastic. The coeliacs, by the way, had a hard time believing that gluten wasn’t the secret ingredient! Really amazing. I have a large bowl of fresh Canadian plums from my own plum tree on my counter 🙂 They’re lovely and purple and drip down your chin juicy and sweet. I want to make this crumble, but I’m not allowed cow dairy or eggs, among other things, for a year at least. Do you think it will work with egg substitute and ‘buttery sticks’ instead? Shauna – This sounds fabulous. 🙂 I was hoping you could clarify the cinnamon needed – the recipe says “1/2 plus 1/2 teaspoon cinnamon.” What is the first 1/2? Thanks! Anyone know a good gluten free flour, available in Toronto, to use in this fabulous recipe? I made it for my sister and it had a kind of metallic taste. She said flour mixtures with too much rice flour can taste like that. Next time I make it for her I want to get it right because everything else about it was lovely. To help Dane, I make my own gluten free flour by mixing 1 cup of corn flour or starch as it’s sometimes known, with 1 cup of rice flour. Then add 1 teaspoon of guar gum. The guar gum replaces the gluten so you can use the flour where ever you would use normal flour. Hope this helps. 🙂 Lynda. 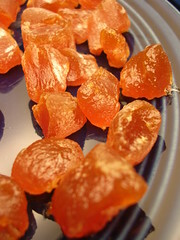 I have Italian Plum trees in the backyard, so have been searching for and trying gluten free plum recipes for years. This is truly the best! You would never know that it's gluten free. My husband, who can eat gluten, loved it! Thank you! Hi i was having some friends round for lunch and found your plum crumble a good start to showing of my cooking skills. After the gluten free friends had left i made it again with regular flour and it was just as good. I had great fun converting your american measures to grams as we dont use cups in Enland but got it right in the end. This will be one of my signature dishes in the future. Thanks. This looks amazing. I've passed your blogspot on to friends who are gluten sensitive. Dane – check out the Bulk Food stores – they always have gluten free products on the shelves. Just ate this crumble for the 2nd time. It's amazing! So amazing that although I never post comments on the web it just seemed ungrateful to enjoy it that much and not thank you. It's so great for those of us who have to wrestle with intolerance to be able to turn to people like you. Greetings from sunny South Australia! I just made your crumble with fresh mulberries bought from the side of the road, and a single pink lady apple. we didn’t have candied or ground ginger, so I just left it out. I used gluten free bread mix for the flour. It was great! I will make it again today with peaches! Wow! I harvested a bunch of plums and stumbled upon this recipe. So good!I doubled it up and it did not even last 24 hours between me &my housemates! The recipe doesn’t say if the butter should be melted, I’m assuming “drizzle” butter means it’s melted, but I wish I knew for sure. I realized about half way through making this that I was out of granulated sugar, so I am substituting brown, we’ll see how it turns out. Thanks for the recipe!